The horseplayers' eminent showdown event is back for 2018 as registration is officially open for the Breeders' Cup Betting Challenge (BCBC) – Thoroughbred racing's biggest live money tournament. Now in its 10th year, the Breeders' Cup Betting Challenge will crown the winner with the highest accumulated bankroll at the end of the two-day Breeders' Cup World Championships, which will be held this year at Churchill Downs in Louisville, Ky., on Nov. 2-3. 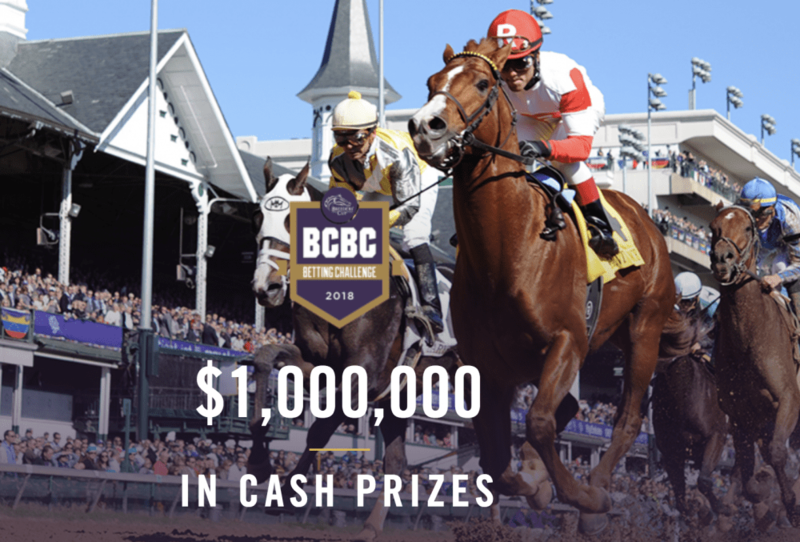 The 2018 BCBC will have an estimated prize pool of more than $1 million based on a minimum of 400 entries. In addition to Churchill Downs (host site), individuals can play from official satellite locations at Gulfstream Park in Hallandale Beach, Fla.,, Monmouth Park in Oceanport, N.J. and Santa Anita Park in Arcadia, Calif., or online at participating ADW sites. To register now or for complete 2018 Breeders' Cup Betting Challenge rules and information, go to BreedersCup.com/BCBC. For the 2018 BCBC, a $2,500 buy-in and $7,500 betting bankroll ($10,000 total) is required of each player. All buy-in monies are applied to the prize pool. Players can bet into the Win, Place, Show, Exacta, Trifecta and Daily Double pools with their $7,500 bankroll over the two days and keep all monies earned from their betting. Added to the BCBC is that a $3-million National Horseplayers Championship (NHC) Tour bonus will be awarded to any horseplayer who wins the Breeders' Cup Betting Challenge and the NTRA Horseplayers Championship in Las Vegas in January of 2019. As part of a reciprocal agreement with the NHC, Chris Littlemore, winner of this year's National Horseplayers Championship in January, is eligible for a $3-million bonus should he win this year's BCBC. In addition, NBC Sports analyst and handicapper Eddie Olczyk also is eligible for a $1-million bonus if he wins the BCBC, having already won the Pegasus World Cup Betting Challenge in January. In 2017, Torrey Pines, Calif., native Nisan Gabbay parlayed big scores in the Longines Breeders' Cup Turf and the Breeders' Cup Classic to close out with a record total bankroll of $537,000, including a $350,000 first prize. New participation records were set last year as well, with 439 players combined between on site at Del Mar, the satellite locations and the ADW websites. This entry was posted in Horseplayers and tagged BCBC, Breeders' Cup, breeders' cup betting challenge, chris littlemore, Eddie Olczyk, horseplayers, national horseplayers championship, NHC Tour, nisan gabbay, pegasus world cup betting challenge by Press Release. Bookmark the permalink.